“We have the highest marginal income tax rate in the Southeast - the 12th highest in the nation. Seven states have no income tax at all. Taxes of all kinds at all levels add up - little by little - to smother growth. Governor McMaster is on the mark in his call for comprehensive tax reform, and NTU is encouraged by his commitment to enacting sweeping changes to the tax code and delivering relief to millions of overburdened taxpayers. While we await further details of his proposed tax plan, we hope it will include substantial cuts to individual income and corporate income tax rates, and reforms to state tax credits and deductions. In the interim, Governor McMaster also urged lawmakers to support returning $200 million to taxpayers in a one-time rebate thanks to leftover funds that were not spent last year. Estimates indicate this rebate would amount to about $87 per taxpayer, giving taxpayers a first taste of what is to come. South Carolinians need tax relief now more than ever. The state’s top individual income tax rate of seven percent is higher than that of any state in the South. Worse yet, this top rate kicks in at only $14,000, meaning an individual can earn an income that is just above the federal poverty line but still be taxed at the top rate. To reduce tax obligations for individuals and families, especially for those of limited economic means, policymakers should consolidate their five income tax brackets into one flat rate significantly lower than the current rate. Allowing Palmetto State families to keep more of what they earn by slashing tax rates is common sense. Doing so will help families save for a new home, a vacation, or perhaps their child’s college tuition. More than 350,000 small businesses are subject to the individual income tax rate rather than the corporate rate and would benefit from a lower tax liability. This would allow them to make new investments in equipment, grow their workforce, or expand their business to new locations - all of which boost economic growth. With states across the country cutting taxes to attract new residents and capital investment, lawmakers cannot afford to stand still or they will fall behind. South Carolina is sandwiched between two pro-growth states, Georgia and North Carolina, both of which recently enacted extensive tax cuts. Georgia last year approved increasing the standard deduction and also gradually reducing its individual income and corporate income tax rates, and North Carolina at the start of this year automatically lowered their individual income and corporate income tax rates. Both Georgia and North Carolina have a significantly lower top income and corporate tax rates than South Carolina. While Governor McMaster wants to prioritize cuts to the individual income tax rate, he should not overlook the economic benefits of reforming the state’s broken corporate tax system. The nonpartisan Tax Foundation notes that while South Carolina has a low corporate tax rate, their base is carved out by special interest incentives. They recommend a significant reduction to the corporate tax rate and licensing fees, and reviewing all corporate tax incentives. By implementing bold tax reform legislation, South Carolinians would be given some much-deserved financial relief, which is especially important in light of the desire to hike taxes by some Democratic lawmakers in Congress. We urge policymakers in the legislature to make tax reform a reality in 2019. More than 1,100 professional economists have joined with the National Taxpayers Union to urge President Trump and Congress to reconsider their trade policies. Click here to view the letter, which includes former White House economic advisors from both parties, as well as 15 Nobel Prize winners. The tax reform package passed by the House and Senate will provide relief to millions of individuals, families, and businesses. 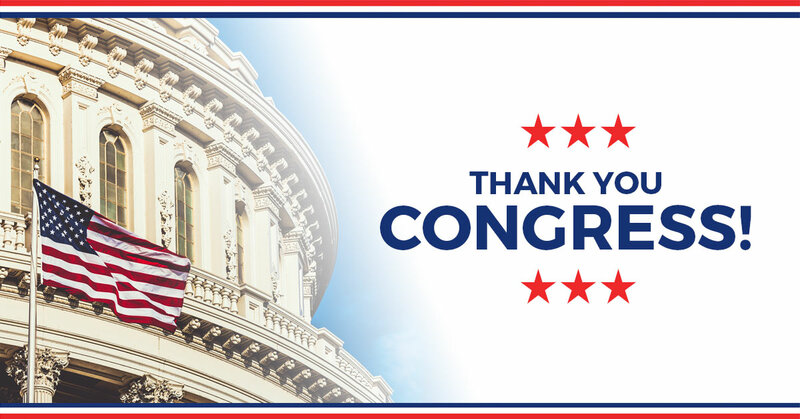 Let's take a moment to thank Congress for delivering strong tax reform before the end of the year.